Nothing can get us in the movies to watch an adventurous story than to add a bit of comedy. This movie based on a book by Billy Crump was written and directed by Taika Waititi about a young boy, Ricky (Julian Dennison) who is in and out of the foster care system. He sees that no one wants him so he put on this tough bully act to soften the blow of rejection from being in the foster care system. Soon, he is taken miles a way to New Zealand where he is given a fresh start with new foster parents. In the beginning, he believes that this is another one of the foster care parent that will cast him aside like all the rest. But soon he sees that his foster care lady, Aunt Bella (Rima Te Wiata) is a bit unlike all the previous foster care mother who sees the good in him. Aunt Bella proves him wrong with her caring but no sense kind of attitude. As things starts to feel like normalcy for Ricky, tragic strikes and Aunt Bella pass away on him. Knowing that Hec (Sam Neill) the grieving husband to Aunt Bella, cannot take care of himself as well as Ricky he decides to return him to the foster care system. Hec feels that Ricky is better off without him. Thus, as he plans to turn Ricky over to the social worker, Ricky decides to run away. 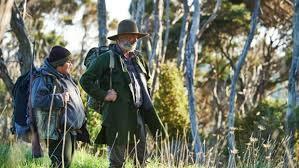 Having no choice, Hec sets off a to find him which lead both character down a man hunt venture to the unknown. Since the social worker suspect foul play, she immediately gets the police involved to track them both down. Hec and Ricky go through through the ups and down surviving the trials as fugitive. This movie was typical of Waititi's sense of off the cuff humor as in Flight of the Conchords and What We Do In the Shadows. One thing for sure the scenery was breath taken and added flavor to the movie. However, the movie felt a bit cheesy and somewhat unrealistic. To see a young overweight kid on the run as a fugitive for over five months and living off the wild of the land, at some point, Ricky should had shed some weight. It was challenging to take this movie serious due to some of the humorless dialogue. Hec and Ricky was on the run for so long it became a bit excessive and lost it flavor. The storyline was too lengthy and the writers should have considered other option verses having the two character run around in circles in the wilderness for so long. However, if you are looking for a bit of entertainment and a some adventure this movie will suit your preference.